Yesterday last year’s Christmas cards were taken of the wall, where we use to hang them in chronological order. As you may have read, I had began to write about Christmas, but soon gave up because I don’t really like Christmas. 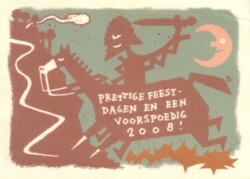 On this page are some of the best cards that we received last year, made by Roel Smit, Martijn Snoodijk and Ben Vranken. The rest I will show you some other time, when I have nothing else to write about. Of course Fake Booij made a new issue of his zine and CD-series this year too. I now know that Fake does the zine together with Peter Pontiac, and the CD with Dirk Kloosterboer. 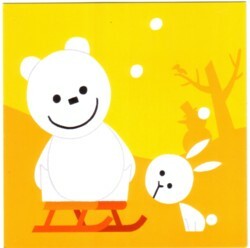 The CD is called Kerstkrakers this year, and although it is a great compilation, it didn’t get much plays in our house. By the time it arrived I had reduced my Christmas music diet to The Fab Four. So Kertskrakers will have to wait till next year. Just like some of the other Xmas compilations that I received. 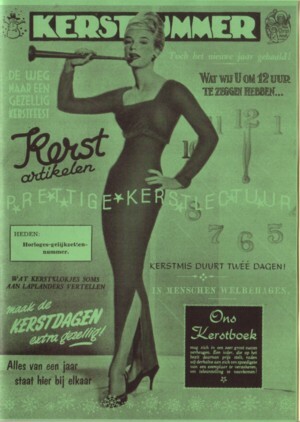 Om KerstKrakers is a track called by Les Paul & Mary Ford called Jungle bells . I am pretty sure that I have never heard this song before, which is strange because I quite like Les Paul & Mary Ford. And as far as I know they haven’t made that much records. I have heard other songs called Jungle bells , but this song sounds different. I will google it up later. 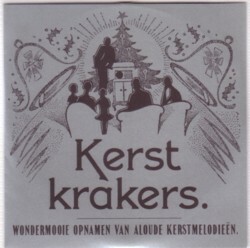 There are at least 15 other songs on Kerstkrakers that I have never heard before, and I should do more justice to this CD. But it is almost summer! So, here are Les Paul & Mary Ford, and the rest will have too wait a few months.